“I blended up this simple soup up with my friend Beth last week and she loved it so much I had to share it with you. When I served it up she put one spoonful in her mouth and sweaked out in in a mouse-like falsetto crying out, “Oh! That is soooo amazing!” We smugly smiled at each other and nodded our heads knowing that we’d be enjoying this incredible offering for years to come. Give your orange sweet potatoes a gentle roast to caramelize them without scorching. Roasting the veggies a day in advance makes this a 15-minute meal. Sweet spuds calm inflammation in brain and nerve tissues, and coupled with ginger and turmeric they help ease joint pain and swelling. Line a large baking sheet with a silicone liner or parchment paper. Toss the onions and sweet potatoes in oil and salt and spread out on the prepared baking sheet. Roast for about 1 hour, until the vegetables are cooked but not burnt. You don’t want any black bits. You are going to put them into the pot to boil and cook further. Transfer the vegetables to a large saucepan and add the vegetable broth, ginger, turmeric, and cayenne. Bring the mixture to a boil, and then reduce the heat to medium-high, and simmer, partially covered, for about 15 minutes to allow the flavors to infuse. Remove the soup from the heat and stir in the macadamias. Allow the mixture to stand for 10 minutes to soften the nuts and cool the soup slightly. 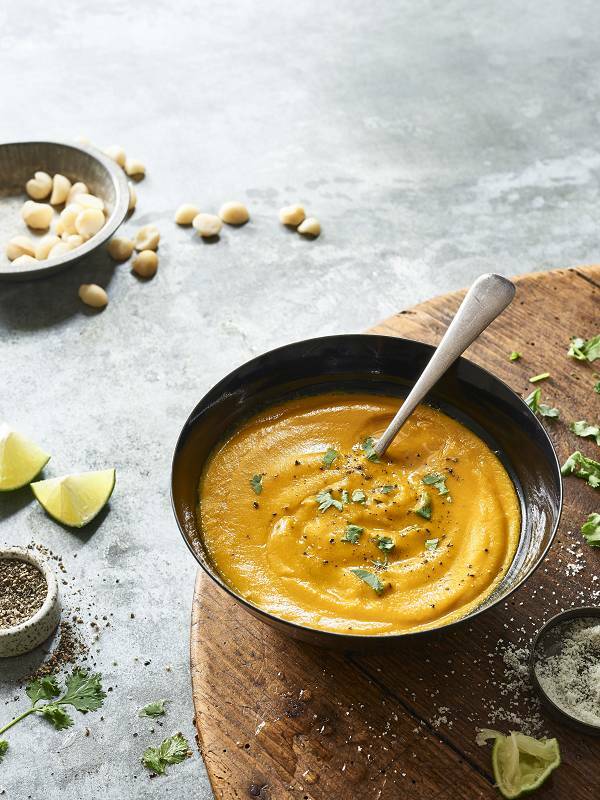 Pour the soup into your blender in batches and puree on high for 1 to 2 minutes, until smooth and creamy. (For conventional blenders, remove the small center lid cap and cover the opening with a kitchen towel so steam can escape while you blend.) Return the soup to the saucepan, season to taste, and warm it over low heat. Stir in the spinach booster until the greens are just wilted. To serve, ladle the soup into bowls and add a splash of the lime juice.